You are currently browsing the tag archive for the ‘Gene Kerrigan’ tag. Anthony Cronin, Roddy Doyle, Hugo Hamilton, Marian Keyes, Frank McCourt, Pauline McLynn, Conor McPherson, Joseph O’Connor, Gerard Stembridge, Donal O’Kelly, Owen O’Neill, Tom Humphries, Charlie O’Neill, Gina Moxley and Gene Kerrigan. Fifteen writers, one narrative, shared between them. The Irish have a love/hate relationship with their culture, this insistence on the soggy island being the home of ‘saints and scholars’. There was a great little show last year called The Savage Eye that dedicated an episode to lancing the pomposity of Irish writers and artists. 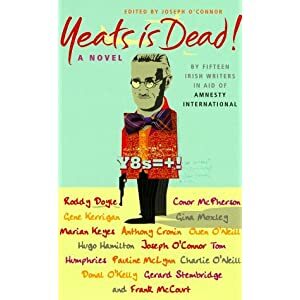 Yeats Is Dead is title notwithstanding, a broad parody of James Joyce’s fiction that mixes crime and satire into the proceedings. With each chapter a different writer takes control of the story, setting off a dizzying chain of one-upmanship. Roddy Doyle is the first up to bat, commencing the proceedings with an accidental murder. Two crooked cops have been working for Mrs Bloom (ho ho!) as hired thugs. Ordered to intimidate an elderly hermit named Tommy ‘Stanislaus’ Reynolds into returning a stolen item, they inadvertently cause the man to have a heart attack. Then he is shot. The chapter closes with the two Gardaí reporting their misadventure to their employer. Mrs Bloom is a formidable woman, who has made a living from theft from an early age. Doyle even includes a stolen ‘papal throne’, from Pope John Paul II’s visit to Ireland in 1979 in her home. The scene is set, with an intimidation racket gone wrong, a crime dame with a controlling interest in many areas of Celtic Tiger Ireland and two bent coppers fearing for their lives. As each chapter follows, however, things quickly escalate beyond this humble beginning. Soon corpses are pilling up; more characters are introduced; there are adulterous affairs; wild swerves in plot; book forgery scams; chaotic trials and political corruption. The McGuffin is revealed to be a lost work of James Joyce’s, an unfinished novel, or possibly a chemical formula, known as ‘Yeats Is Dead’. The story rambles on in a shambolic manner, with each of the characters unknowingly being controlled from behind the scenes by the canny criminal mastermind Mrs Bloom. I laughed twice during the fifteen chapters of this book. The first time courtesy of Roddy Doyle having a bent copper’s mistress reply to a request to talk dirty by simply saying ‘The Flood Tribunal’. Owen O’Neill, spotting an opportunity to poke fun at all the Joycean namedropping throughout the book, names a character after the famous Irish broadcaster Eamon Dunphy, which also raised a chuckle. The remainder of this book is a train wreck, especially the chapter written by Marian Keyes. Here we have an author trading in lazy stereotypes and dated references, who is over-indulged by the Irish reading public. She introduces into the plot a Dublin Southside rap music fan named Micky McManus, who secretly wants to be Black. It is an insulting and ridiculous character portrayal, which is quickly mocked by some of the later contributors by transforming Micky into a blackface sporting, would-be Rastafarian homosexual. I chose the above quote from Anthony Cronin’s chapter as it summed up the weaknesses of this book perfectly. At times some of the writers attempt to introduce some social realism into the proceedings, but for the most part Yeats Is Dead trades in Irish stereotypes and clichés. Frank McCourt wraps up proceedings with a smutty parody of James Stephens that owes more to the Carry On series. Vulgar and farcical like the Celtic Tiger era that inspired it, this is an absolutely toxic waste of time. ‘Romantic Ireland’s dead and gone…’ and spinning in its grave.